Pit Bull Growler AT/Extra Scale R/C 1.9's are miniaturized versions of the Pit Bull Growler LT 1:1 tires. Featuring a multi-varied directional tread design, these tires deliver a directional look with non-directional functionality, and have features designed to increase control while enhancing stability and contact patch. The Growler AT delivers excellent lateral bite--incredible stickiness and exceptional traction. Use the pull down menu to choose between Komp or Alien compounds. Multi-varied Unique Tread Blocks: Pit Bull designs are not just about looks. They serve a purpose with their multiple varied lugs, edges and sipes. These help to maximize traction especially in off-camber situations. Inside ribbing: Provides sidewall support and stability. Thicker Bead: Provides more meat for Beadlocks to bite on. 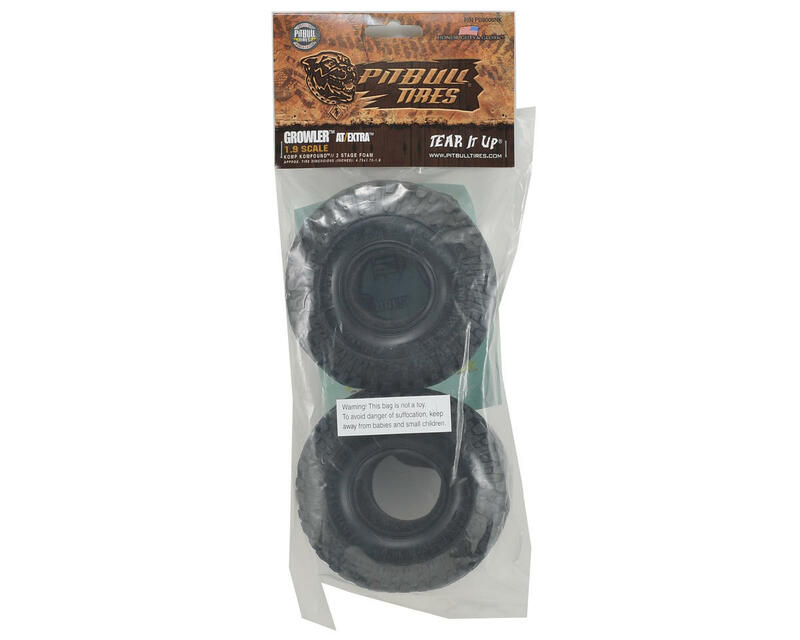 Integrated Sidewall Protectors: Bands of rubber in the sidewall that add support and control. Alternating Center Lugs: Increased biting edges for improved traction. Sipes: Looks like the real tire and helps increase traction. Over-the-shoulder lugs: Wraps down the sidewall and adds extra strength & traction to the shoulder & sidewall areas. 4.75 inch Unmounted Diameter: Perfect size for most Scale rigs. Foam Included: Two - 2 stage foams designed to accentuate the performance. Should be usable with other tire brands as well. Komp Kompound: Gets better and better as they break in and you can use them for your daily hobby time as well as competition. Alien Kompound: Alien Kompound is a super sticky rubber compound, and as they say at Pit Bull, they're "Stickier than Alien Snot!" Alien Kompound is great for wet or dry and provide great holding power even in off-camber terrain. These look great and are perfect on the rocks. Easy mounting on three different brands of beadlocks. Great scale look and decent foams. Very good tires for crawling in a SCX10 II. 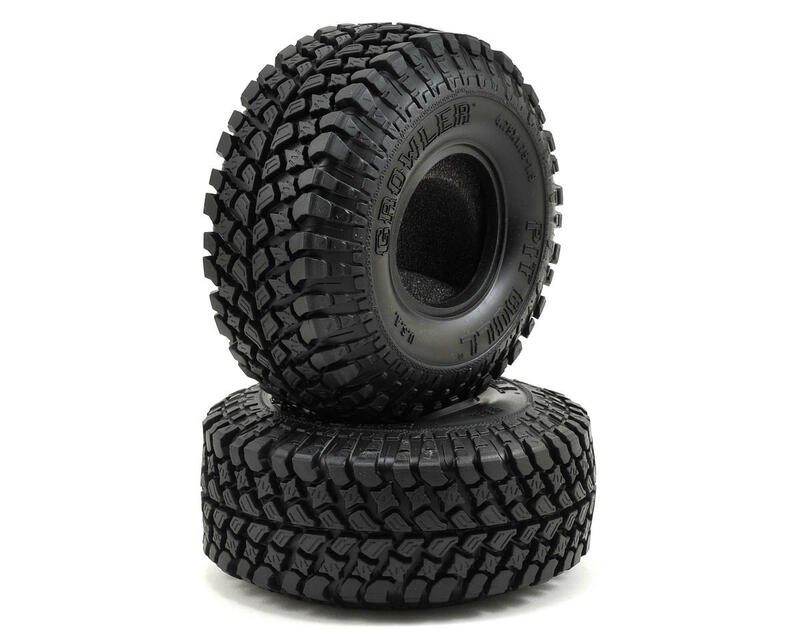 recommended with axial ring weight and only the external foam. Very good and scale tires. Are a little wider but not that much taller then the stock Maxxis tires. Will recommend to anyone.